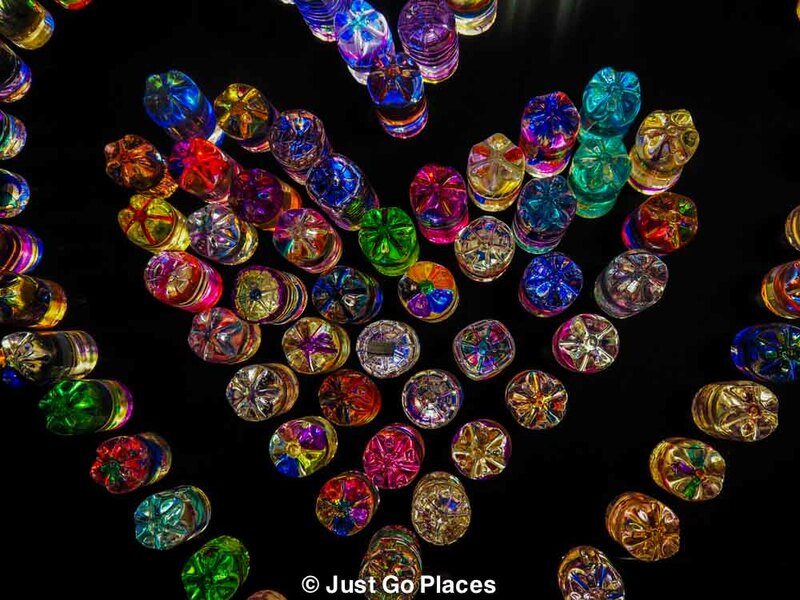 An outdoor art festival, Lumiere London, was staged for a brief four days in London this past weekend. Previously it has been held in Durham in the north of England in November. 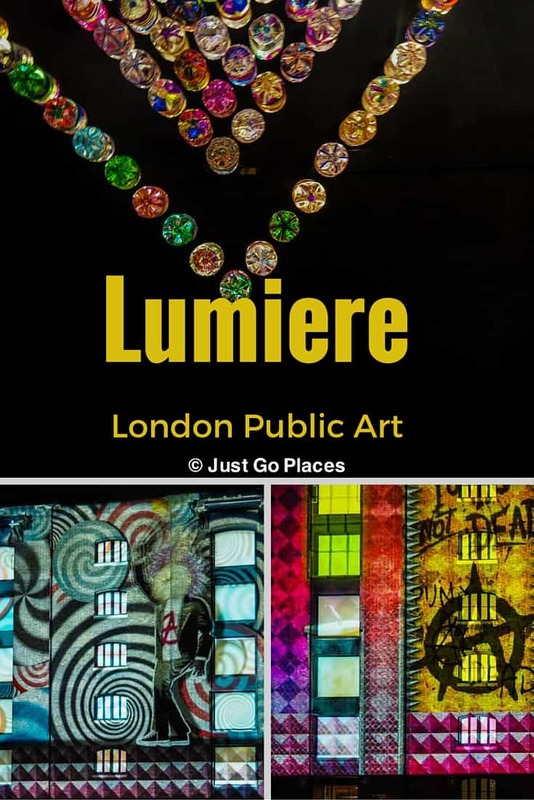 Located in four different locations throughout London, it was free to the public and featured the works of many different international artists. 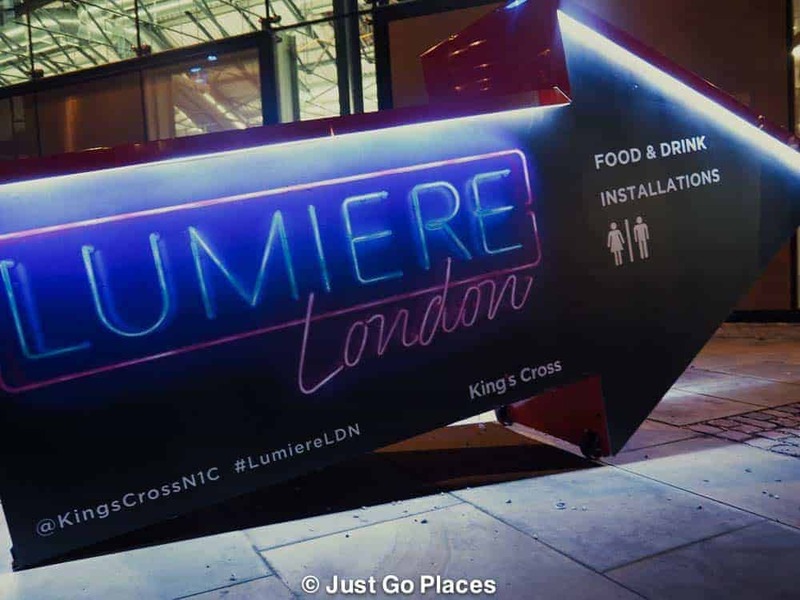 We went to see the art installations for Lumiere London at the Kings Cross location. Located near Central St. Martins, the newly developed area has a lot of wide open space to accommodate large installations as well as the attending hordes. The installations were spread across Granary Square, Goods Way and Kings Cross Station itself. Lit signs pointed you in the right direction. My favourite installation was Litre of Light by Mick Stephenson, Central St. Martins, UAL and MyShelter Foundation. 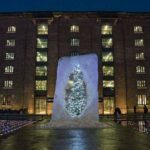 Located inside the Granary Square warehouse, the installation had several pieces as well as a learning component for the participants. 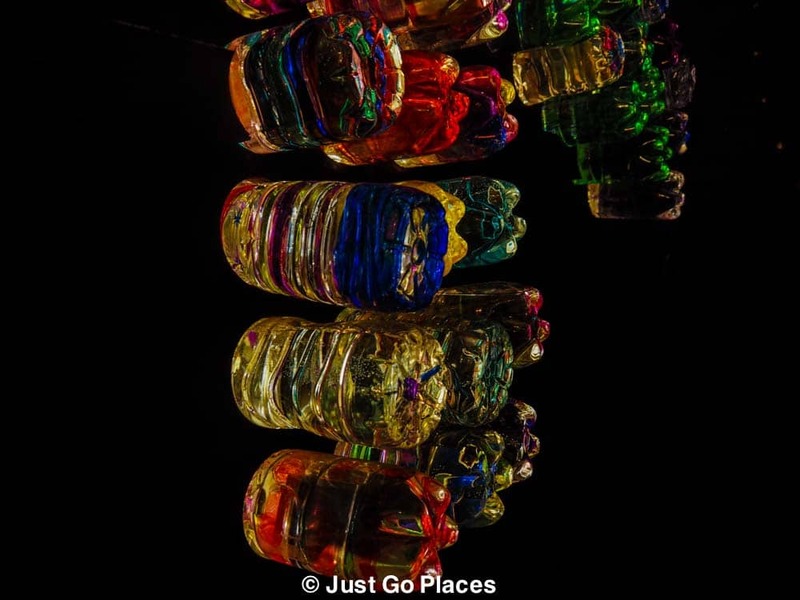 It was fascinating to learn that you can create a simple solar light bulb by recycling a plastic bottle. You fill it with water, add bleach and push it through a hole in the roof. This technology, developed at MIT in the USA, has now been used to bring light bulbs to developing countries worldwide. 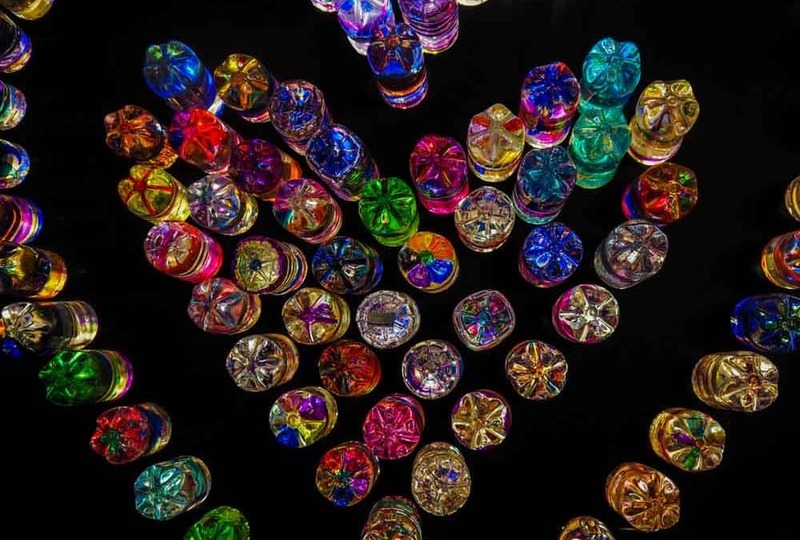 At the exhibition, locals students coloured in the bottom of the plastic bottle to create a stained glass effect. 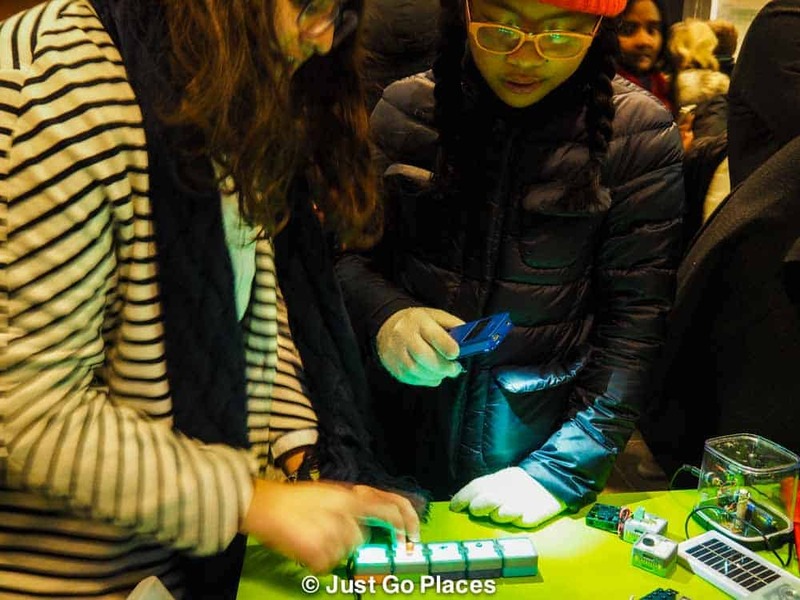 The exhibition also showed visitors with children how light and electricity worked. Bailey from Dish Our Town learning about how it all works. Further audience participation was encouraged by giving people lit bottles to hold and walk around with as they viewed the installation. 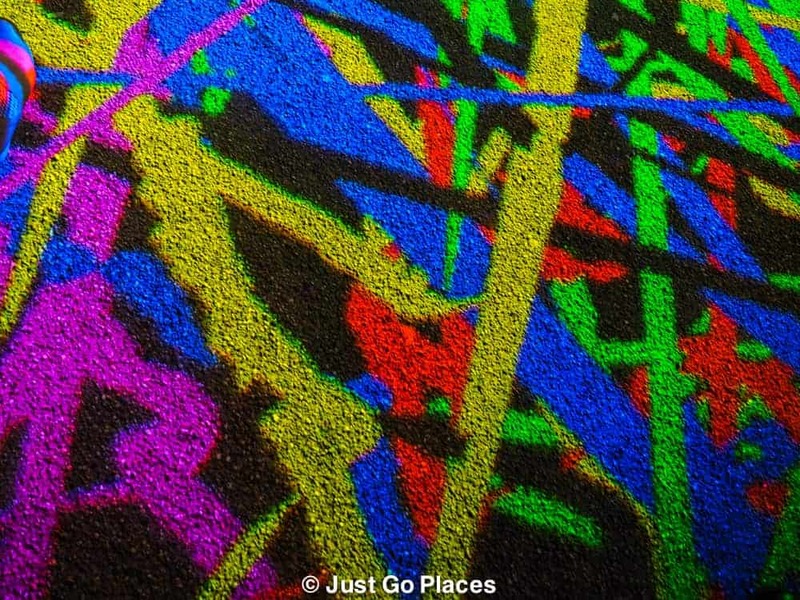 Another cool interactive exhibition, Light Graffiti by Floating Pictures (a Swedish company) let people use torches to paint pictures on the ground using light. Once the ground was full of colour, the slate was wiped clean and the participants could create a new and different piece of art. No two pieces will ever be the same. 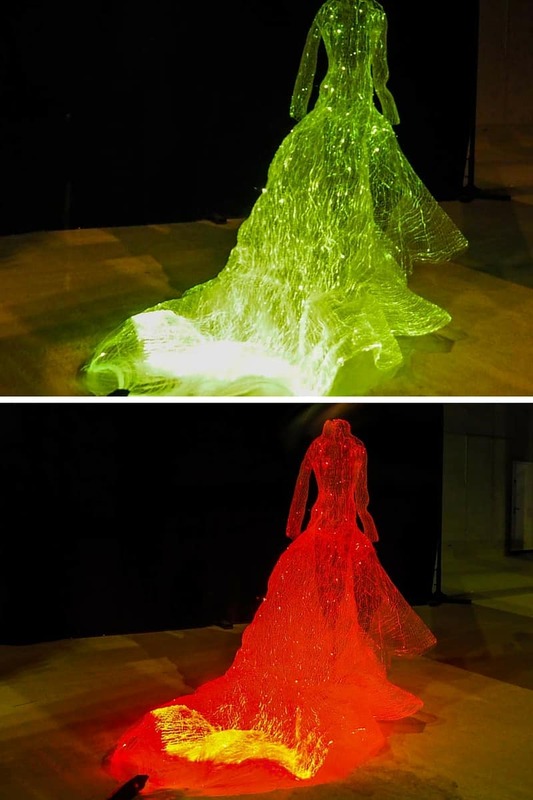 A French-Korean artist, Tae Gon Kim, uses fibre optics and LED lights to create ghostly dresses. The ghostly LED lit dress is perfect for a haunted house party. 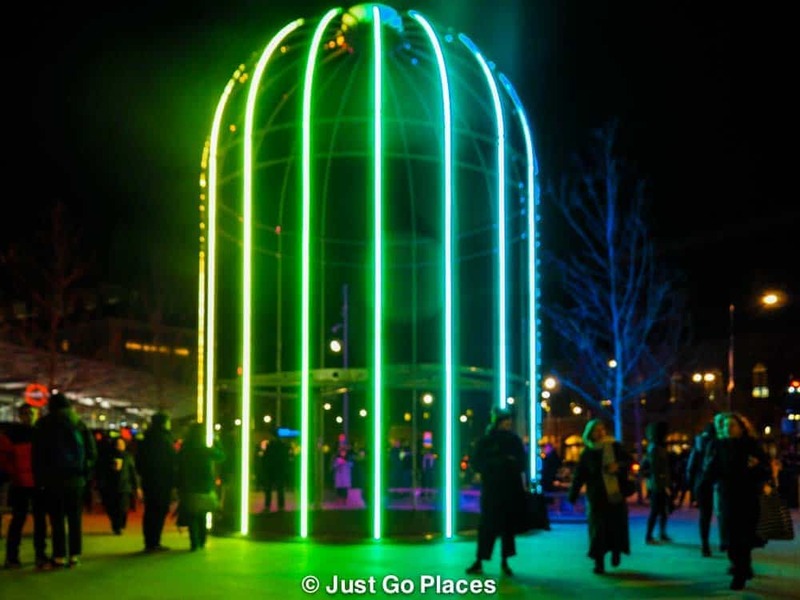 Identified Flying Object is a permanent piece in Kings Cross by French artist Jacques Rival. It is a giant birdcage with a swing in the middle. Needless to say, this artwork was very popular with the children. I am curious how the London pigeons are going to react to a giant birdcage for them to decorate in their own special way. I know why the caged bird sings. To keep warm. The flashiest of the pieces because of size and sound, Circus of Light by Portuguese company, Ocubo, always had hordes of people watching it. 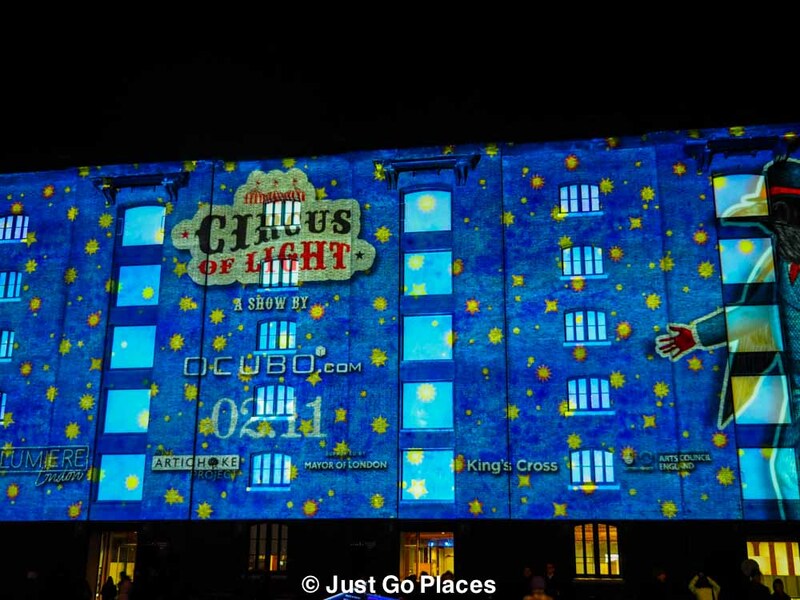 It was a sound and light show projected onto the side of the Granary Square warehouse building conveying the idea of a circus. The irony, Kings Cross, really is a circus even without this circus of light. London has so many street fairs during the spring and the summer. There are the occasional Christmas markets in Decemberoccasional Christmas markets in December as well. 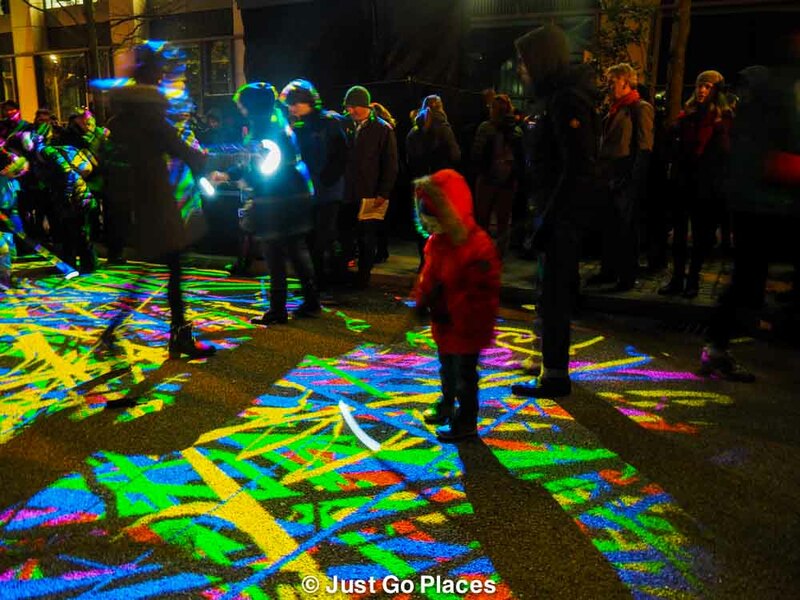 It was great to have an outdoor street festival during the dark nights of January. I remember how much fun it was to see the temporary exhibit of public art by French sculptor Richard Orlinski on the ski slopes of Val d’Isere last year. The only downside? It was bitterly cold but that didn’t seem to wane the enthusiasm of the crowds of people who were out to see the show. I enjoyed the variety of the installations. 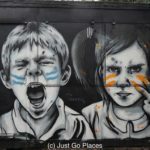 Some were interactive and family-friendly while others looked at global issues or paid homage to that most urban of public art, street art. I also appreciate that some pieces will be permanent. 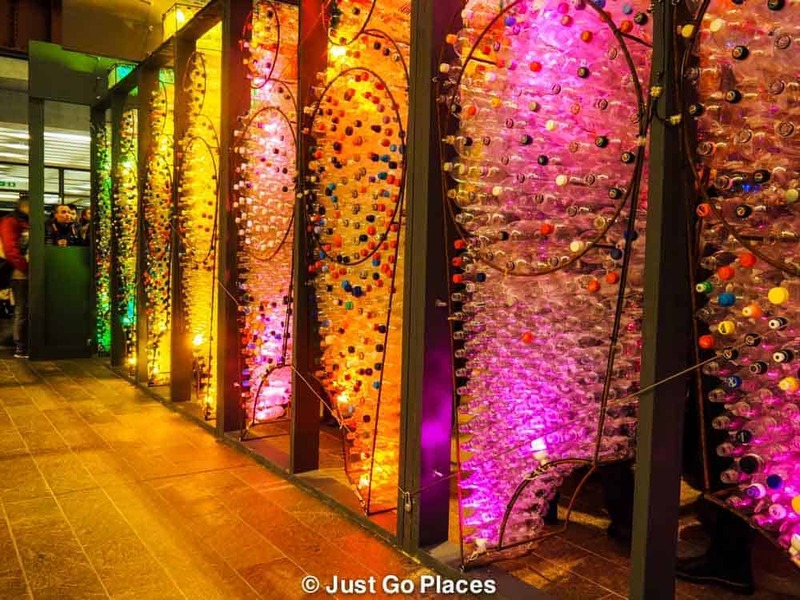 It’s simply amazong how light installations can transform London! Thanks for the great photos! That’s good to know! 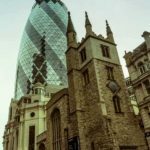 I think this was the first in London. This looks like it was such a cool event to take part in! Europe seems to love casting light shows on monuments and such, which I enjoy watching – but London seemed to have taken it a step further with interactive exhibits. 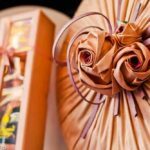 I would have loved to participate – thanks for sharing! 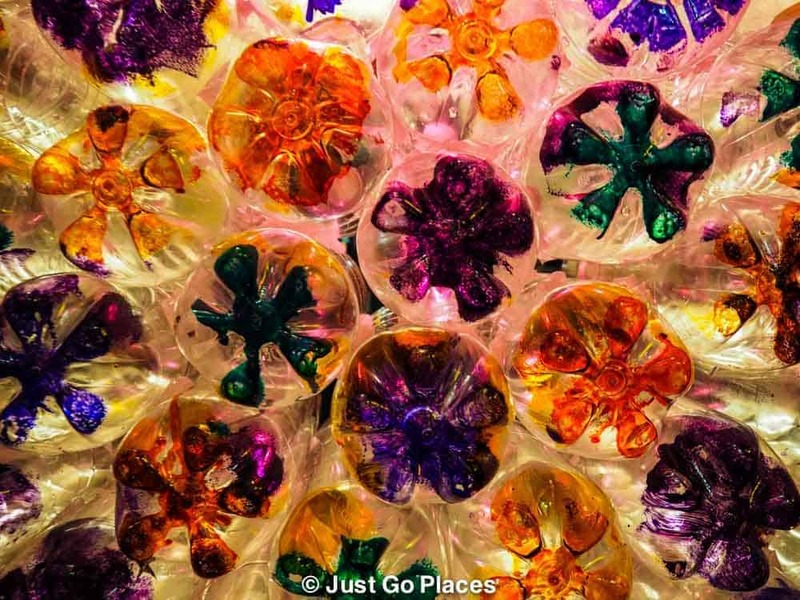 The recycled bottle bulbs were indeed cool! 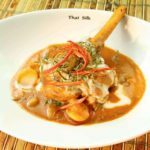 I wish we made it to London for this, it looks spectacular! It was! Hopefully it’ll be a regular thing in London every year. Oh cool! I also went to see the lights. My favourite part was Leicester Square. I didn’t get to Leicester Square. Someone also said Mayfair was great. Oh! We got to go on the giant birdcage swing when we were passing through Kings Cross around Christmastime. Didn’t know it lights up at night – how cool. Love the idea of those other interactive displays too. I do like a bit of art you can have a go on. Great event. They should definitely repeat it. I was really surprised more people weren’t swinging in the birdcage. Our kids had no line to get on it. And they thought it was a lot of fun. I think so too. Lots of people out with their kids probably because 6:30 is dark and a reasonable time for school age kids to be out. Me too! The ghostly dresses were hard to photograph but so very cool. The LEDs made it look very spooky. This looks like wonderful event. Loved all of it, but I really thought the dresses look real awesome. Thanks for sharing them with Saturday Art! p.s. 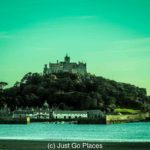 I think I have corrected now the blog button code – sorry ’bout that.